"Come on along and listen to the lullaby of Broadway." "Come and meet those dancing feet, on the avenue I'm taking you too, 42nd Street." "We're in the money, we're in the money, we've got a lot of what it takes to get along!" Those are just a few lines from the classic musical 42nd Street, which I was surprised to learn first appeared on Broadway in 1980, having been adapted from the 1933 original movie musical. I've seen it twice before, on tour and at the Chanhassen, and what I remember most about it is wanting to tap-dance down the sidewalk to my car after the show. There's something about tap-dancing that's so infectious and invigorating; it makes me want to go sign up for the first tap-dancing class I can find, even though I've never worn tap shoes in my life! 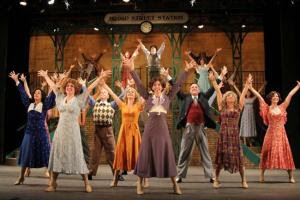 From the moment the curtain rises to reveal more than a dozen pairs of tap-dancing feet, to the rousing performance of the title song at the end of the show, Bloomington Civic Theatre's 42nd Street never loses that energy. 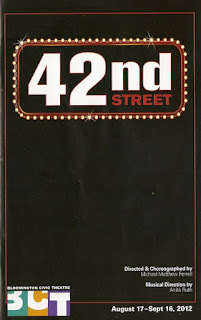 42nd Street is one of those great musicals about musicals, where the unknown becomes a star. Peggy Sawyer arrives from Allentown, PA, lands a role in the chorus of a new Broadway musical, and takes over the lead role when the veteran Dorothy Brock is injured. The show-within-a-show format allows for several musical numbers that have no bearing on the plot but are just fun to watch. First and foremost, the amazing choreography by Michael Matthew Ferrell, who also directs. This show is all about the tap-dancing, and the choreography here meets that challenge - sharp and fast and thrilling. A talented ensemble that very capably performs that intricate choreography. Fabulous 1930s period costumes by Ed Gleeman. One of my favorite things about BCT is the full orchestra that always sounds rich and beautiful under the direction of Anita Ruth. Yay for the pit orchestra! Larissa Gritti is quite charming as our heroine Peggy, with a lovely voice and super fast feet. Michael Fischetti, last seen as Colonel Pickering, again impresses as the famous and fearsome director who finds new life and love of the theater through his young star. Last but not least - Bonnie Erickson as the veteran actor who passes the torch to Peggy, and the very funny team of Betti Battocletti and Steve Zehr as the writers of the show-within-a-show who also provide the comedy bits. In the last year or so, I've learned that you can always count on Bloomington Civic Theatre for quality productions of classic musicals. Even if much of the cast is comprised of "amateurs" with day jobs, they obviously pour their hearts and souls into the theater every night. 42nd Street runs through September 16 - check it out if you love a classic musical. Next up - a Sondheim show I've long been wanting to see, Sunday in the Park with George.